Our company, as the major domestic production hub in this field, manufactures clutch facings for a wide variety of vehicles from sports cars, to large and industrial vehicles. We tailor make clutch facings for individual purposes and usage, and our products have been adopted by all Japanese automobile manufacturers. We offer clutch facings in extensive size variations of exterior diameter QUOTE 150- QUOTE 430 used in small cars to large vehicles. 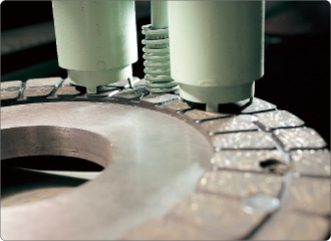 We also manufacture heat insulators for brake friction pads. 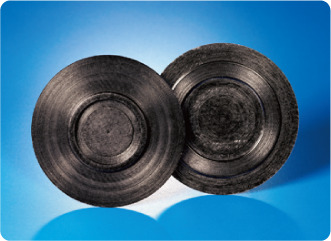 Brake parts require a high level of reliability in quality, and thus our products are adopted in extensive areas such as automotive and Shinkansen super express trains’ brake friction pad insulators to offer safety and comfort. 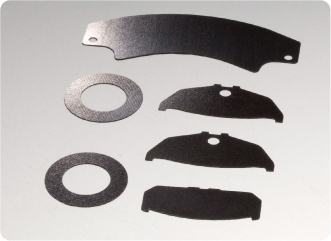 Noise shim is a product that has effects on both insulation and prevention of grabbing chatter with a realized coefficient of friction QUOTE =0.13. The product is installed in the gap between a brake piston and a brake friction pad, so as to eliminate the heat generated by the brake pad.